FYI, on writing perspective, this Trip Review is written from my wife Lucretia’s point of view, if only in use of names, pronouns etc. However, in most of the writing we collaborated on the various details. Thursday September 17 – Tanya took us to the airport in Orlando. We flew from Orlando International Airport direct to Dublin. The plane was delayed for about 10-15 minutes, due to a problem with the luggage count. This trip we are also taking with John’s Mom & Stepdad (Irene & Carlos), as well as our niece, Zia, (Irene & Carlos’s granddaughter). Also John’s Mom’s plane was delayed getting into Dublin for an hour due to bad weather. Friday September 18 -We arrived in Dublin at 9:55 am. His mom arrived at 10:15 am. It took a while to get the car rental, but the guy was great with giving John tips on how to travel the circles around Dublin. We got to the Brooks Hotel around 12:15pm. Our room was ready but we had to wait on Irene’s room. Zia had left over Blueberry yogurt from the plane for lunch, Carlos had his left over sandwich from breakfast on the plane and Irene just had a food bar, which John and I also had for lunch. Once we got settled in we went to the National Museum of Ireland, Kingship & Sacrifice Exhibit, Grd Flr, Kildare St, it was free to get in; stayed for about 30 minutes. Next we went to Trinity College – Book of Kells, we paid €10 each to get in. We stayed for about 30 minutes also, due to our late start. We proceeded to Molly Malone Statue; we got a picture of John and I but for some reason it did not show up. We did not get a chance to go back and retake the picture. Because we had lunch before we even started the day we went to Ha’ Penny Bridge and took a couple of pictures and then went to the Millennium Bridge, it started to rain shortly after that, we quickly went to The Temple Bar and got some pictures there and decided we would get our Guinness beer at dinner also due to starting the day so late, after that we went back to the hotel to get jackets and for Irene to change into sneakers. By the time we got back to the hotel Irene was tuckered out and had to take a nap. So the three youngest went to get a picture at Dublin Castle (we did not go inside due to time constraints). We proceeded to Dublinia & Viking World, we got there a half hour before they were closing to prepare for a special event, John had a discussion with the person in charge at the front desk who explained there was something special happening that day and if we wanted to wait we would have until 8:00pm. We decided that the 30 minutes was fine for us. John then asked about a military discount, the man said yes and ended up giving us everything for free and we were able to stay for an hour, until 5:30, when the special event was to begin. As we were about to leave we were asked if we wanted to go up in St. Michael’s Tower, of course we said yes, got some great pictures, but on the way down I must have stepped down the wrong way and irritated my knees because on the way to St. Patrick’s Cathedral both of my knees started to hurt, so we only took a picture of the Cathedral and went back to the hotel. By the time we got there Irene and Carlos were ready to go to dinner, so John suggested we go to the pub (Hairy Lemon) that was right down the street from the hotel so I didn’t have to walk very far. We had BBQ Ribs and John had Cottage Pie. Zia fell asleep before her dinner came. I had my Guinness just like I told Jeremy I would. After talking about what we were planning on doing for the next day, John and I decided we were not going to do the Traditional Irish Musical Pub Crawl. We went back to the hotel and Irene, Carlos and Zia went to their room to stay the night. John and I thought about going out for dessert but decided to give my knees a rest so I will not have any problems the next day. So we got everything ready for the next day. I thought the first day in Ireland went absolutely great, especially in light of the late start due to delayed flights and issues getting to the hotel with traffic. So far, so good. Saturday September 19 – We got an early start and went down for breakfast, since we were not sure what was included we asked and were pleasantly surprised to be able to get whatever we wanted (not just the buffet). We checked out of the hotel and made a quick stop for some pictures outside the Guinness Storehouse. We did this since Jeremy, our son-in-law, could not make the trip with us, and is very much into all kinds of beer. Next we headed north out of town, into County Meath and drove to the Hill of Tara where there is an obelisk and where the kings of Ireland would meet and have ceremonies. After this we headed over to the Bru’na Boinne Historical Site. This is an area where several burial/ceremonial earthen mounds are located. Some of these are very small and a few others quite large. The two main sites are Knowth, (the largest) and Newgrange, (almost as large) but you get to go into the passage and to the center of the mound. In between visiting the two mounds we got a bite to eat. Once again we tried to get pizza, but just like in Australia, this time French Bread Pizza and it was not to my liking. It was more like a sub, with cheese and big chunks of tomato, onion and green pepper. I did not eat this, John & Irene shared it, but thankfully they had brought a banana and granola bar, which I did eat. The whole visit to this site was most of the afternoon. Next we headed off to the Cooley Peninsula, crossing into County Louth. We drove all the way around the peninsula. We got to see the Irish Sea and the Carlingford Lough, across the bay is Northern Ireland and our circuit actually took us into Northern Ireland (UK) for a wee bit, before we returned to the Republic. We also saw ruins of a castle. Our next stop was to head into Dundalk and check in to our first Bed & Breakfast, the Glen Gat House, host is Tim. After this we walked a few blocks of Dundalk and went to dinner at Kingfisher Restaurant, they had a wide selection and much more reasonable prices than the first place we looked at here in Dundalk and even the pub we ate at our first night. Next we went back to the B&B and visited showing some pictures and then to the room and bed. Another good day. Sunday September 20 – Once again we got up early and went down for breakfast. We will probably start each day like this, as our trip includes free breakfast at each location. We were asked if we wanted an Irish breakfast, which is egg, sausage, bacon (strip of ham), dark and light pudding and a half of a tomato. Of course I chose only the egg and sausage. John had cereal. Next time I will pick the bacon, sausage was not that good. After breakfast we checked out, stopped to fill up the tank and then headed out. Our trip today takes us across the northern part of the Republic toward Sligo. As we were on our way, we had a road closure, which took us off route. While trying to get back on route, we decided to alter our agenda; it was much easier to go into Northern Ireland then we had expected. So we chose to go to Giant’s Causeway at the most northern point of Ireland. It was very windy here and wet, the rain started out as a drizzle and ended up a down pour (so we got drenched). Carlos was lucky he headed back a little earlier than the rest of us. The rock formations here were very interesting and unique. From there we headed to Sligo as previously planned. On our way in we saw there was a road that reads CONNAUGHTON ROAD. The B&B here, St Martin De Porres, was a very lovely cottage. The lady (Mary) was very welcoming showed us our rooms, then made coffee for Carlos and John and had little biscuits for everyone to nibble. She suggested several place for us to eat. We wanted to go to one of the pubs she suggested but they did not serve food on Sundays. We decided on an Italian place called Bistro Bianconi, we got a 12” cheese pizza and John and Carlos shared Spicy Penne Arribiatta (pasta dish with chicken). By the time we were done eating it had started to pour once again, John had to run and get the car to pick us up, but still we all got wet. We drove around and located the sign with our family name on it and took a picture for posterity. Even with the wind and the rain we had another good day. Monday September 21 – When we went in for breakfast, were asked again if we wanted an Irish breakfast, we all got scrambled eggs and bacon, John was able to get pancakes/waffles. Mary was very pleasant and hospitable as she did not have to prepare the pancakes. Due to the alterations in the plans yesterday we had to fill up with diesel again. We actually got up a little earlier today so we could have more time to go to the base area at Queen Maeve’s Tomb, (we did not go to the actual tomb, as we did not have time to climb up and do the rest of what we had planned for today.) We got to the parking lot and read all about Queen Maeve’s Tomb and took a picture. On our way to our next place we stopped to get pictures of the local animals that came close to the road. We crossed into County Mayo where our first stop was Lough Conn (Lough means Lake), where we stopped and took several pics, and once again it started to drizzle. Then we headed off to Westport, a very scenic drive. We stopped at a little café called Willow Café Tea Room, had Tea/Coffee and pastries. Strolled along the streets and bought some souvenirs and headed to Croagh Patrick, a pyramid shaped mountain. After this we left and the GPS gave us bit of trouble, it sent us down a really narrow road that only two bicycles would fit, just to cut off a corner of the regular roads and that would have only been 1km longer. Once we got back to a better road we headed to Connemara National Park. When we entered County Galway we saw sheep just roaming the road and shoulders, we had to stop and let them pass, and take some pictures (of course). Shortly after we made it to the park, once again it started to rain so John and I took the yellow trail which was just a few minutes long, we were smart enough to wear our ponchos this time (kept us nice and dry). Had some hot chocolate and a bite to eat then on our way to the next B&B (Heather Lodge). This B&B was even nicer than the first two. The one yesterday was much nicer than the first one, and this one was not only just as nice, but the rooms and the bathrooms were also much larger. Just like yesterday, Jane offered us coffee & tea and served that with slices of carrot cake, all of which were scrumptious. After getting settled we headed the short way into Clifden for dinner. We walked the couple blocks of this small town and decided to eat at Guy’s Bar (Pub) and we finally heard Irish Music. I had Fish and Chips, John had Beef and Guinness Stew both were wonderful and we tried a new Irish dessert called Sticky Toffee Pudding; which is a cake covered with Toffee Sauce and vanilla ice cream on the side. Also while we were there Zia found a friend to hang out with, named Alisha, whose mother was one of the musicians playing. Tonight it did not rain but it was cold so we had to wear our jackets. We are having such a wonderful time here in Ireland, can’t wait to see how the rest of the trip goes. Tuesday September 22 – When we arrived last night, we were asked what we wanted for breakfast, we all got scrambled eggs and bacon, and the book said ask for special requests, so John was able to get pancakes again. Jane was very pleasant and hospitable as she did not have to prepare the pancakes. We got started just a little early today in the hopes of having some additional sightseeing time when we reached Galway at the end of the day. First we drove towards the village of Cong. Along the way we stopped at a shop we saw, for some souvenirs and a card for Irene and Carlos to send to Shaun for his birthday. Once we got to Cong, we went around the small village once, then found a place to park. After this we visited The Quiet Man Gift Shop and Museum. The museum is a replica of the cottage, (The White O’Morn), from the movie, filled with various artifacts and memorabilia from the making of the film. It was very interesting. Next we walked through the ruins of the church that was used in the movie. After this we grabbed some coffee and tea and had a small bite for lunch. Then we headed off to Galway. We drove through the city and finally decided to see about parking at the B&B, Kiltevna, host is Bernadette, and walking back into town to sightsee and for dinner. Since it was only about 1 km, we decided this would be easier than dealing with the traffic and a car park. Once into town we visited the Browne Doorway in Eyre Square. Next we walked to the docks, for a boat cruise on the Corrib Princess, the boat ride took us out onto Lough Corrib. This was fun, we went past Menlo Castle, (in ruins, but about to be restored). On our way back they did a demonstration on making an Irish Coffee and Carlos was chosen to get the coffee to drink, but first he had to dance with the girl who made it, an Irish Dance that she instructed him in. He did FANTASTIC and got to enjoy the reward. Next they asked for volunteers for an extended Irish Dance, (The Siege of Ennis), and John went up. They all did GREAT, we have a video to prove it. After getting back to town we headed to the section called The Spanish Arch and ate at Finnegan’s Pub. I had roasted breast of chicken and John had Shepherd’s Pie and another Irish Coffee. After dinner we walked through the rest of The Spanish Arch area, took a photo in Throne Chairs in a medieval pub called King’s Head, stopped for another look at souvenirs, then headed back to the hotel. This B&B was closer in quality to the one in Dundalk, not as nice as the last 2 nights, but more than adequate. This was a very enjoyable day. Wednesday September 23 – Day started off grand, had several choices for breakfast, everyone had something different, I had french toast and John had pancakes. When we were leaving Galway the GPS was giving us some trouble, if it was not for John’s excellent direction skills we probably would still be stuck in Galway. Our first stop on today’s agenda was Dunguarie Castle in Kinvarra, in County Clare. The castle was lovely to see, it had four floors and each floor was a different time period. We decided to skip Ailwee Cave since we were going to see another cave later on in our journey across Ireland. On our way to our next stop, we went thru the “Burren”. A very interesting, rocky limestone landscape. Along the way through the Burren we stopped at Poulnabrone Dolmen a burial ground from the Neolithic period, signified by large columns and a very large capstone on top. We also stopped at the ruins of an old fort, Caherconnell Fort. After this, just a short drive and we were at the Cliffs of Moher. A very impressive cliff-face, along the Atlantic Coast of Western Ireland. Magnificent sheer cliffs and views of the Atlantic, which pictures can’t really capture. From here we headed off to our first overnight stay in a castle at Dromoland Castle just outside Ennis town. The staff were very welcoming and helpful, especially Michael who met us as we pulled up, took our bags and parked our car, and Leisha, the girl working the front counter. This castle is very gorgeous and elegant with a very large room and over-sized king-size bed, “a man would have to be a sprinter to catch his wife in a bed like that”. We had dinner at one of the locations in the castle. I had a burger, John had Irish Lamb Stew, we shared a delicious dessert, Traditional Bramley Apple Crumble (basically apple pie ala mode) along with tea and John had an Irish coffee. Then we relaxed in our lovely castle room. Twas another great day in Ireland. Thursday September 24 – We began with an early breakfast at 7:30. John & I both had pancakes this morning. We went back to the room and packed, as we had to wait for the valet to bring round the car and take our bags out. It seems it’s not a typical Ireland day if the morning doesn’t start off with some rain. We headed off, driving a short way into County Limerick and on to Bunratty Castle and Folk Park and by the time we got there the rain had stopped. We decided to do the Folk Park first, since that was outside and if it started to rain later we would be in the Castle. It just so happened, it did not start to rain again until we finished with the castle. Which in my mind, was the perfect time, as we were done and ready to get back in the car. Once we were back in the car, everyone talked it over and said, since we just finished a castle, we would go ahead and skip King John’s Castle & Treaty Stone and just move right on to Lough Gur, (burial mounds and tombs). GPS was set to take us to Lough Gur visitors centre, which is in County Kerry, but it took us to another part of the Lough Gur tombs (Lough Gur Wedge Tomb). John had seen a sign for Lough Gur Heritage Center, so we set off for that and found the place we wanted to go to. While getting ready to walk the trail, John spoke with the attendees, they suggested also to go see Grange Stone Circle. Along the trail, we had to climb 110 steps, so Carlos and Irene chose to forego the steps and went back to the visitors centre. When we were all done visiting Lough Gur, John took us to see Grange Stone Circle, not realizing that we were getting behind on schedule and that we would end up in a bit of a traffic problem due to construction, we had to give up going to Torc Waterfall which was a bit beyond the location of our B&B for tonight (Applecroft House), host here is Kathy. Once we got in the lady of the house (Kathy) told us what was available in town for dinner, we got settled in and shortly after went out for dinner. We found a nice place called Tatler Jack, but wanted to check out a place called Hannigan’s (which is his mom’s maiden name), but before we could, once again it started to rain, so we just chose Tatler Jack. The food was great and the prices were just as good. I had pork chops and John had cottage pie. John is now into Irish coffee so he had two of them as his drink of the evening. Went back to the B&B and had to go thru a Garda (police) check point, they just looked at us and said thank you, go on. We all thought that was very odd. We got back and discussed the next day’s events and settled in for the night. We are having a wonderful time here in Ireland. Friday September 25 – Today we made sure to have everything ready so that right after breakfast at 8am, we could head out. 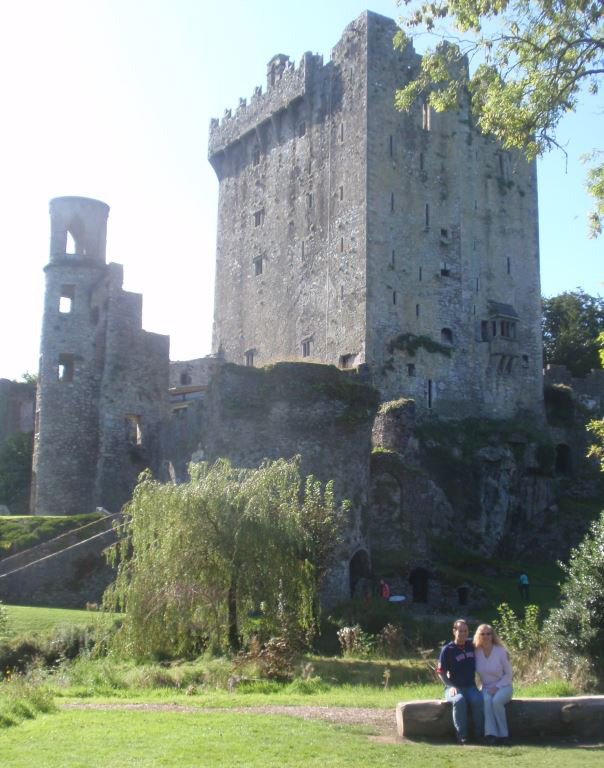 Our first stop took us into County Cork and to Blarney Castle, where we kissed the Blarney Stone. After this we headed off to Cork and pulled into a car park in the city centre. Irene & Carlos stayed in the car and took a nap whilst me, John & Zia walked around the English Market (a fish, fruit, veggie and food market dating back to olden days). We also walked around some of the streets looking for souvenir shops, we didn’t see any. After this we headed across the harbor and went to the Fota Wildlife Park. Here, Zia & I set out on our own and went through the whole park, seeing most of the animals. We met back with John, Irene & Carlos near the end. Afterwards, we Skyped Tanya and showed her a bit of the Irish countryside. Then we headed to Cobh and our B&B, Mount View, the host here was Tony. We got settled and walked into the town centre, walking down a very steep hill and looked around some, and we tried to arrange the Ghost Tour we had read about, but it was not too be, as they could not get a hold of either of the two guides and we had not prebooked. So then we just went to dinner at the Trade Winds Pub. I had fish & chips and John had Chicken Pasta. After dinner Irene, Carlos & Zia took a cab back to the room and John & I did a little pub crawl. We hit 2 pubs and I had a Guinness and John had an Irish Coffee in each pub. Then we walked back to our room. Saturday September 26 – We had breakfast early and then went back into Cobh to see the Titanic Experience. They gave us tickets with real Titanic travelers names on them and at the end of the tour we got to see what had happened to them. I got Nora Fleming and John had Patrick Fox. Out of the five of us only Zia was a survivor and the rest of us died that fateful night. One of the passengers that boarded the liner was a Michael Connaghton (a slight variation of our spelling) who also passed away. Next on our agenda was to head over to Youghal to see the Medieval Walls, which at one time encircled the town. As we were traveling around today I kept on sneezing and my nose felt like it wanted to run, so I must be starting to come down with something. Then we went to Cahir Castle in Tipperary County, we had a fun time going up in the towers of this castle which was surrounded by water at one time. We were then going to go to the Rock of Cashel, by the description in our guide book, John thought that this was going to be a great place to go to next, but in fact, due to the place being under reconstruction, the place was not impressive at all, it was the first place that we went to that I thought was a waste of our time to go to. By this time we were all ready to go to the B&B (Clonmore House) and get settled in for the night. Since we did not spend that much time at the last place, we had time to look over the town, but found out all the shops closed early and only two diners were open after 5:30pm, and more odd this being a Saturday night and all. So we did not have a big choice to choose from and we picked the Italian restaurant named La Candela, we all partook of the cheese pizza we ordered and John and Carlos shared a pasta dish again. We stopped in a couple grocery stores as John wanted to pick up some small item to bring back to the room for dessert, then we returned to the room and we met and were greeted by the B&B host, Jim. His daughter was here looking out for the place when we came in earlier. Jim was very friendly, asked a lot about us and John was talking about his military service with him. He also made some of us pancakes for breakfast the next morning. Sunday September 27 – Got up this morning and found that I did indeed catch a slight cold. My nose either was running or sinuses were clogged and I had a slight cough. We went down the hallway to the dining room to have breakfast, around 8am again. We all had the usual breakfast and then headed off to County Waterford and the House of Waterford Crystal. We were originally supposed to see Waterford Crystal Factory, but they closed in 2013. We had bought the guide book in 2011. Got into town and John dropped us off in front the place and parked the car at the closest car park and boosted it back to us. He got there just in time for the next tour. It was amazing how they created such beautiful crystal. Since we saw two castles yesterday, we decided to skip Kilkenny Castle and replace it with Waterford and Suir River Railway (train ride). We had a fun time, Zia had a project from the people to find certain objects while on the train; she found all of them and had a grand time doing it. After that we proceeded to County Kilkenny and Dunmore Cave, Carlos did not go down with us for there were too many steps for him to come back up and his doctor had warned him not to do anything too strenuous. Then we were on our way into County Carlow and our next B&B, (Laburnum Lodge), in Tullow. Once again the GPS acted up and we had to call the Lady of the house, Annie, to get us there. On arrival there were two French Mastiffs calling hello to us but would not come near us. We found out they were on electronic leash. Once again the Lady of the house was very friendly and had a cup of coffee with us and chit chatted away, she also informed us of the best place to eat. She also had a problem with her wifi router settings so John helped her and got all that sorted out. Headed out around 6:30pm and ate at Tara Arms Pub. We shared a sirloin steak and John added a side of cream potatoes (mashed) and of course his now favorite drink, Irish coffee (2). Whilst sitting there we were chatting with some locals, Niles Conley and his mates. Monday September 28 – Up early and breakfast at 8am, we both had pancakes. Next we headed off to Duckett’s Grove Castle. We learned of this castle from the TV show, “Destination Truth – Banshees of Ireland”. We put it on our itinerary even though we didn’t expect to see much there. It turned out to be much more impressive than we had thought. A very large unique castle with lots of crosses in the walls and other interesting aspects, but we did not see any banshees. After this we headed into County Wicklow and came upon a surprise town, Hollywood, Ireland. Next we passed through the Wicklow Gap which had very interesting landscape and a beautiful valley. Beyond this we arrived at Glendalough Round Tower & Monastery. We could not go up in the tower but it too was very interesting with a lot of graves all around the grounds. Next we drove to Powerscourt Falls. Lovely waterfall and John & Zia walked out on the rocks to just near the falls. We shared some snacks and Zia dragged John to all the kiddie playground equipment. After this we headed back to County Dublin and our second castle stay at the Fitzpatrick Castle Hotel. We went to dinner at The Club Bar in the local town of Dalkey. Another good, fun pub. Sadly this is our last day of the trip, so back to our room to relax and pack for our flight home tomorrow. But it has been a lot of fun!!! Tuesday September 29 – Got an early start as Mom & Carlos’ flight leaves at 11:30am. We loaded the car, had breakfast and after a bathroom break, left about 8:15am for the airport. We got to the terminal just after 9am, dropped Irene, Carlos & Zia and said our goodbyes. Next we circled the airport and filled up the tank in the car, then went to the rental car drop off, took care of that, then waited for the shuttle back to the terminal. We had a lot of time as our flight was not due to leave until 2pm. We checked in at Aer Lingus, did paperwork for Customs and also refund of our VAT Tax, then went through the first airport security. Then we shopped at the Duty Free Shops, then we had an early lunch at Burger King. Next we went through the US Pre-Clearance area, Customs, Immigration and a second search. Then to our gate to wait for our flight. The flight home went well enough, just seemed long, it was about 8 ½ hrs of flight time. In Orlando, we got off the plane, picked up our bags and walked outside just minutes before Tanya drove up to get us. It was really a great trip and we’d love to go back. GENERAL TIPS AND OBSERVATIONS – As you may have heard, Ireland really is very green. Although there were some grays and browns on the landscape in places. Driving on the left (in the right hand side of the car), wasn’t too hard to get used to, thankfully we had an automatic so we didn’t have to shift backwards too. What was more difficult was dealing with the narrow lanes and parking spaces. That was a constant challenge. If anyone goes here and they are military, it doesn’t hurt to always ask for a military discount. Whilst many places did nothing in that regard, one place (Dublinia) gave our entire group complimentary access. A few other places gave either the senior rate or in one case, the child rate, so it never hurts to ask. We found that while none of the people we met or dealt with were ever rude, the people in the country areas were much more friendly and outgoing. In the cities some of the people were more business-like, pleasant, but not overly friendly. Ireland is definitely a must visit location, slainte!